Move oven rack to low position so that tops of pans will be in center of oven. Heat oven to 350°F. Grease bottoms only of 2 (8x4-inch) loaf pans or 1 (9x5-inch) loaf pan with shortening or cooking spray. In large bowl, stir zucchini, sugar, oil, vanilla and eggs until well mixed. Stir in remaining ingredients except nuts and raisins. Stir in nuts and raisins. Divide batter evenly between 8-inch pans or pour into 9-inch pan. Bake 8-inch loaves 50 to 60 minutes, 9-inch loaf 1 hour 10 minutes to 1 hour 20 minutes, or until toothpick inserted in center comes out clean. Cool in pans on cooling rack 10 minutes. Loosen sides of loaves from pans; remove from pans and place top side up on cooling rack. Cool completely, about 2 hours, before slicing. Wrap tightly and store at room temperature up to 4 days, or refrigerate up to 10 days. Quick breads are leavened by either baking powder or baking soda versus breads made with yeast. The key to a tender crumb and even rise is to just stir the batter enough to moisten the dry ingredients. The ratio of dry ingredients in this recipe works well for subbing in other vegetables, fruit and spices. For Zucchini Chocolate Bread: stir in semi-sweet chocolate chips or chunks of baking bar instead of the nuts. For Pumpkin Bread: Substitute 1 (15-oz.) can pure pumpkin purée for the zucchini. For Cranberry Orange Bread: omit the zucchini, cinnamon, cloves and raisins. Stir in 1/2 cup milk and 2 teaspoons grated orange peel with the oil. Stir 3 cups fresh or frozen (thawed and patted dry) cranberries into batter. Bake the loaves for 1 to 1 hour 10 minutes. Need healthier breakfast or lunchbox options? Grease the bottoms only of 24 regular-size muffin cups. Fill cups about 3/4 full. Bake for 20 to 25 minutes or until the tops spring back when lightly touched. Consider experimenting with reducing the amount of sugar in the recipe and boosting the vanilla, which helps enhance the overall sweetness of any baked good. To make muffins: grease bottoms only of 24 regular-size muffin cups. Fill cups about 3/4 full. Bake 20 to 25 minutes or until tops spring back when touched lightly. As silly holidays go, this one is a doozy. August 8 is National Sneak Some Zucchini Onto Your Neighbor’s Porch Day. This whimsical holiday was dreamed up by Tom and Ruth Roy, the silly-at-heart creators of National No Socks Day, Humbug Day, and Make Up Your Own Holiday Day. 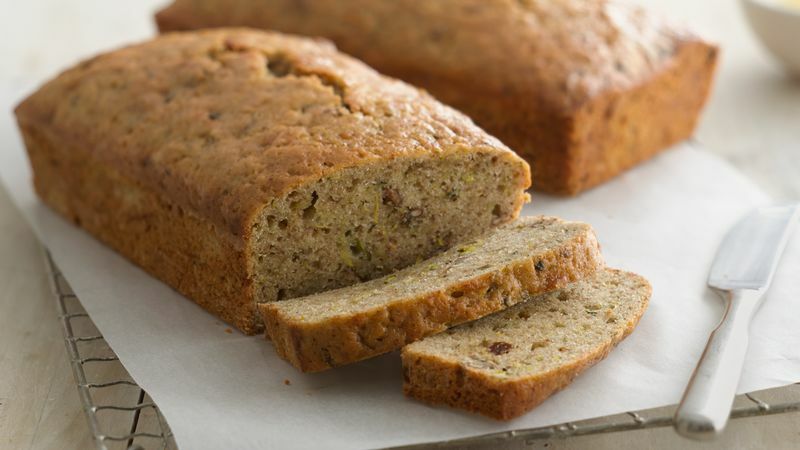 And while sneaking the veggies right onto the porch is certainly fine, wouldn’t it be great to “upgrade” the holiday spirit a little bit and offer up some loaves of this simple zucchini bread to your neighbors instead? When they taste the sweet, spice-redolent quick zucchini bread, they’ll be campaigning for more national holidays involving the beloved green squash. And if making this zucchini bread recipe has you ready to try more, you’ll find traditional favorites, quick-and-easy shortcuts and fun new twists in Betty’s Best Zucchini Recipe Collection.